✔ Universal Vacuum Attachment - Dust Daddy, Easily Attaches to Any Vacuum, such as Dyson vacuum hose, shark Vacuum and so on. This vacuum cleaner attachment works with most standard sized vacuum hoses. the blue part is detachable to adapt with smaller or bigger hose. Easily attaches to any vacuum ,such as dyson vacuum hose ,shark vac and so on. ✔ Best Cleaning Tool - Get rid of all the dust you couldn\'t reach before Great for vents, keyboards, drawers, window blinds, furniture, cars, couches, jewelry boxes and so much more! It is the best cleaning tool ever! ✔ Easy to Use - Just connect this to your vacuum and you can clean, flexible tubes, strong suction and long size all of this can impress you deeply. ✔ Save Time and Energy - No need to move objects anymore, flexible tubes can fix all. Long and flexible tubes have access to any deep corners, no longer need to do more job. 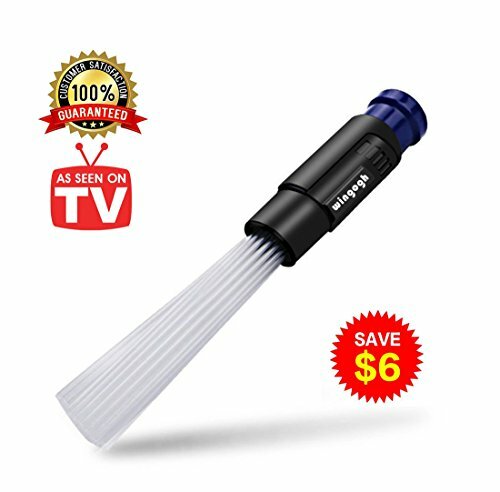 This design allows you to just suction in the dust without worrying about that larger items or debris being sucked in as well.Ergonomic grip for comfort & control.It is the best cleaning tool ever,no need to move things before dusting. ✔ Good Performance & Handy Tool - You need to check your vacuum connector size first. Our dual joint bores are 1.48\" and 1.3\", which is the standard size for most vacuums. You only need to measure the outer diameter of your connector. Fit to this size for your vacuum. When you done your cleaning work with this you would be happy for your purchasing, and you will be amazed for what it has done.